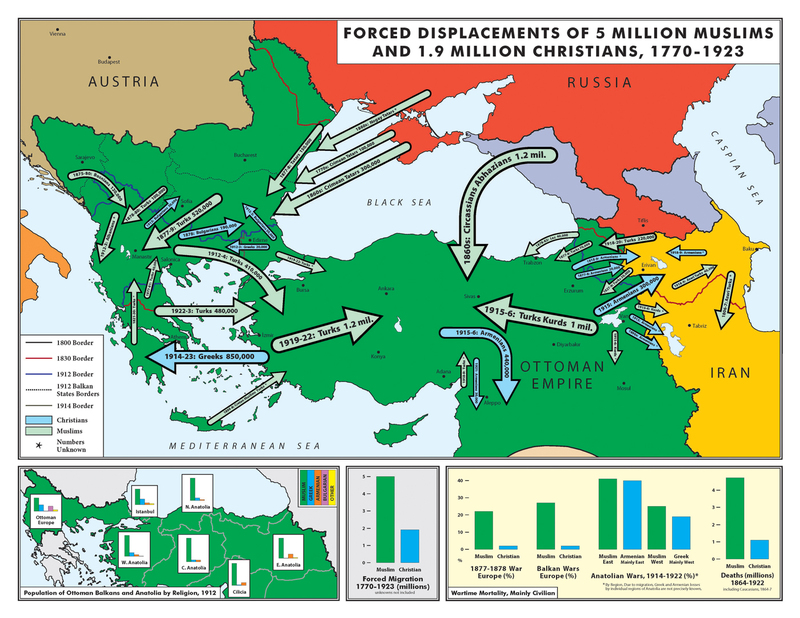 The breakup of the Ottoman Empire set thousands upon thousands of forlorn refugees on the move. 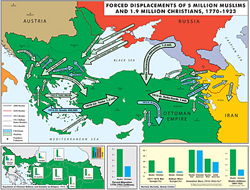 The breakup of the Ottoman Empire set thousands upon thousands of forlorn refugees on the move. Most western chronicles of this era focus only on those of the Christian faith who suffered. TCA is now publishing an annotated map displaying the trails of 5 million Ottoman Muslims who were displaced from the Balkans, Caucasus, and Crimea between 1770-1923. The map also records and provides historical context for the 5 million Ottoman Muslims who died between 1864-1922 in the wars that were fought to dismantle the Ottoman Empire. Prepared by Justin McCarthy, Professor of History at the University of Louisville, the map is a powerful visual tool for both the historian and the casual viewer who seeks better to understand the cataclysm that effected so many millions, Muslim and Christian alike, during the final years of the Ottoman Empire. "The peoples of the Ottoman Empire suffered some of the worst disasters in history. They were forced from their lands, never to return, and died in great numbers. All groups suffered, but those who suffered most were the Muslims, especially the Turks. I hope that this map will demonstrate the disastrous fate of all those peoples," said Professor McCarthy. "TCA is very proud to have supported this publication and thanks Professor McCarthy for his tireless investigation into these lost and forgotten Ottoman Muslim communities. Few Turkish families do not include a grandmother or grandfather from those distant lands...from Greece, Bulgaria, Macedonia, Crimea or the Caucasus...or a story of internal displacement due to the Anatolian wars. The founding fathers of modern Turkey urged the ravaged people of the young Republic to look forward, rather than back. Sadly, other communities have turned their tragic moments into an unquenchable enmity toward Turks. This map is a positive step in overcoming the bigotries inherent in accounts that ignore or dismiss Muslim losses as the Ottoman Empire was dismantled," stated Lincoln McCurdy, TCA President. The map can be downloaded in pdf format here. Hard copies can be requested by sending an e-mail to info@tc-america.org.